FOR half a century Jose Garcia Moreno has walked the same footpath. Despite two strokes, a heart attack and a tractor accident that left him with one arm, the grandfather insists on walking up to seven hours a day. Paralysed down one side and wheezing badly from a former 60-a-day cigarette habit he shuffles along, using a crutch, and hell bent on taking his exercise. But now – in a sign of the times – the ancient mule track that he takes from his house near Ronda has been blocked off by a neighbour who wants to fence off his land. Claiming it has never been a public right of way the owner has installed a two-metre high gate and padlocked it. He has also planted olive trees on it. But he has clearly not bargained on the strong will of pensioner Moreno, 68, who has called in lawyers and alerted the local Guardia Civil. Due to his diligence he has now got the town hall to confirm that the path is in fact a ‘vereda’ or ancient public track. “Using a couple of ancient deeds from local properties which had the track clearly marked, the mayor could hardly deny the path’s existence,” Moreno explained. Four metres in width, it will now have to be cleared and made available to all the neighbours, who live in the Ribera de Don Rodrigo area in Arriate near Ronda. “It is an outrage that due to greed people are shutting off ancient rights of way just to make a fast buck,” continued Moreno. Moreno was born in the area in 1941, when there were no cars, roads or even electricity. An agricultural labourer, he lost his arm in a tractor accident in 1977 while putting up cement posts to install electricity to the valley. Awarded a meagre pension, since then his wife Luisa has been forced to do all the planting, tilling and picking of the vegetables the couple survive on. Unable to work, the labourer started to drink heavily and aquired a cigarette habit of over 60-a-day. This eventually led to two strokes, the second which left him paralysed down his left side. Despite this though, the father-of-three has continued to walk the same route every morning, leaving his house at 7.30am in the winter and 6.30am in the heat of summer. He walks up to seven hours in one go, stopping along the way to talk to dozens of local people. He has even continued his daily routine despite suffering a mild heart attack last year. “My doctor tells me it is good for the heart and I should just keep walking,” explained Moreno, who has only been to Sevilla, Granada and Malaga once in his life… on his honeymoon. But while he has not travelled much around his native Andalucia, he understands the importance of Ronda globally for nature. 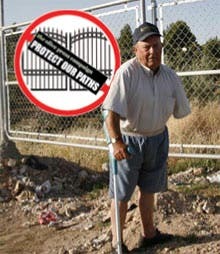 A spokesman for Arriate town hall said: “It has now been sorted out and the owners will have to take down the gate. “It is only a small path, but it has been in existence for years, is on the local deeds and is listed in the Catastral. The owner of the land has not applied for a permit to put up a gate.